how do your priorities and decisions change if retirement will never be an option? mind map (so far) of week 1 of Technologies of Persuasion online course. Why Johnny Can't Program audio lecture - mind map notes. most of these notes are what the speaker, Douglas Rushkoff mentioned in the lecture - I've paraphrased some of it whilst taking notes. one of the other class members, monster (Caroline Jack) has transcribed the audio lecture!, so this would be a more complete / accurate account of it. throughout time, there have always been small groups of well educated & well meaning people who help to promote cognition & agency. Agency considered in the philosophical sense is the capacity of an agent to act in a world. The agency is considered as belonging to that agent, even if that agent represents a fictitious character, or some other non-existent entity. The capacity to act does not at first imply a specific moral dimension to the ability to make the choice to act. Moral agency addresses issues of these type. Human agency is the capacity for human beings to make choices and to impose those choices on the world. It is normally contrasted to natural forces, which are causes involving only unthinking deterministic processes. In this it is subtly distinct from the concept of free will, the philosophical doctrine that our choices are not the product of causal chains, but are significantly free or undetermined. Human agency entails the uncontroversial, weaker claim that humans do in fact make decisions and enact them on the world. How humans come to make decisions, by free choice or other processes, is another issue. The capacity of a human to act as an agent is personal to that human, though considerations of the outcomes flowing from particular acts of human agency for us and others can then be thought to invest a moral component into a given situation wherein an agent has acted, and thus to involve moral agency. If a situation is the consequence of human decision making, persons may be under a duty to apply value judgements to the consequences of their decisions, and held to be responsible for those decisions. Human agency entitles the observer to ask should this have occurred? in a way that would be nonsensical in circumstances lacking human decisions-makers, for example, the impact of Shoemaker-Levy into Jupiter. In certain philosophical traditions (particularly those established by Hegel and Marx), human agency is a collective, historical dynamic, more than a function arising out of individual behavior. Hegel's Geist and Marx's universal class are idealist and materialist expressions of this idea of humans treated as social beings, organized to act in concert. DR: "I don't think we can quite frankly"
we end up teaching the "literacy of the last one"
God says to Abraham, "you'll be a nation of priests"
we actually got a small number of rabbis / priests who could read and write, mostly just read..
did we get a civilisation of 'writers'? what is energizing the rhizome? how do we make what they're doing, about what we're doing? are often about creating the "marketable student"; the "marketable graduate"
they're saying "how're we going to compete with the Chinese, the people in Bangalore"
but they may have to let students in on the fact that there is a conflict - between trying to promote real lateral thinking and the ability to create, and construct an argument. Walter Jackson Ong, S.J. (1912-2003) was a professor of English at Saint Louis University for over thirty years. Over the course of his career, Ong wrote a number of groundbreaking studies in the fields of orality and literacy studies. Some of these works include Orality and Literacy: The Technologizing of the Word, The Presence of the Word, and Ramus, Method, and the Decay of Dialogue. why are the roads in my town built this way? why are the streetcars gone? so this makes you think, why don't we use streetcars any more? and once you realise how a tv commercial is put together, you can understand how a politicians speech is put together. the transparent interfaces of the 1980s and 1990s get replaced with Windows, and what is Windows about? the main communication of Windows is not about "we make the computer easier for you to use"
the main communication of Windows is about "stay back", "we will use the computer for you"
how do you install a program in Windows? why did they pick the Wizard? it's not the "helper"
so then they said, "let's not make the internet about contact, let's make it about content"
it's so bad, that you can play something legal that you own, and Windows will come up and say "Windows doesn't think you have the rights to play this video - are you sure you want to proceed"
attached is the TED_Talks_Kevin_Kelley.mm file. There's been lots of discussion on the vlogtheory yahoogroups list about videoblogging - debates over content, medium etc. 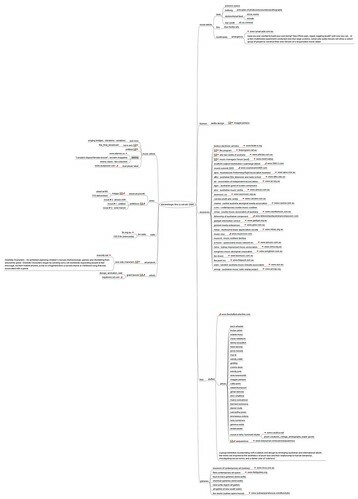 I've done up a quick mind map (using sourceforge freemind) to try to collect my thoughts. it may not be completely in line with the ideas of the group, but could be useful as a starting point to capture thoughts, for me at least. I haven't included everything yet, but it's a start. or below is a screenshot of the mm/pdf file. a summary of the Sarai Reader 04 paper called "The Revenge of Lowtech : Autolabs, Telecentros and Tactical Media in Sao Paulo" by Ricardo Rosas. I've finally gone through the bag I brought back from electrofringe / this is not art 2005. haven't had time to write it up, so I'm trying a mind map from sourceforge's freemind instead.